By Jillbeingstill in Family Tree on April 30, 2013 . Nice article! 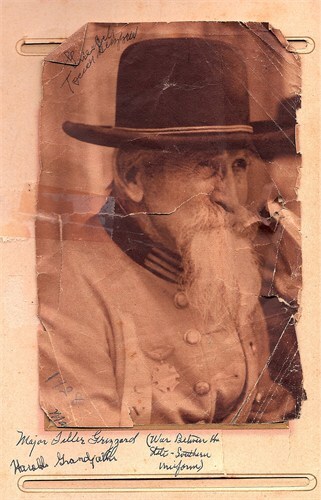 Major Tiller Grizzard is actually my 2nd Great Grandfather. Thank you, Virginia! I love sharing what I’ve found with family, especially those I haven’t met. Thanks for the article my 3rd great grandmother is Dora Grizzard daughter of William Henry Grizzard and Susan’s Kennedy. Does anybody know who Susana Kennedy’s parents are? I saw on the 1850 or 60 census where she was listed close to james Kennedy and zilpha Lindsay Kennedy but not sure if that is her parents. I live near goodletsville, TN where several of William Henry’s ancestors are buried in a cemetery up here. Sorry Jason. I don’t have any record of Susanna’s parents. But I’ll keep my eyes open for you. I’m so happy I found your site! Hi there cousin!! Thanks for stopping by. I haven’t been working much on family tree lately, but it’s one of my favorite things to do!